All four unique, powerful essential oil blends from the Isagenix Essence line. Ideal for natural cleaning solutions, energy support, better sleep, and more! 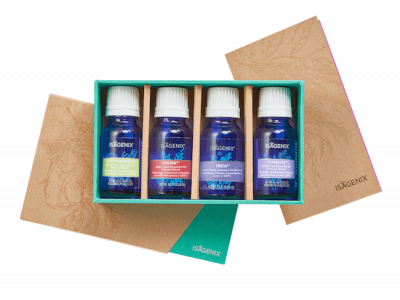 Take the guesswork and complexity out of essential oils with the Isagenix Essence Blends Collection, a set of four unique blends expertly formulated to target a range of health and wellness concerns. Long prized for their ability to naturally target a variety of wellness concerns, essential oils are truly nature’s prize. The experts at Isagenix have carefully harnessed the power of nature to create these potent, high-quality essential oils. Although powerful on their own, certain essential oils become even more effective when used together. Isagenix has carefully studied each essential oil to determine the most efficient, powerful, safe blends. This Isagenix Blends Collection includes all four of the blends from the Essence Collection. Each unique blend, crafted by world-renowned experts, is created using a meticulous 8 step process. Isagenix DefenseShield – DefenseShield features a unique, potent blend of essential oils designed to support healthy circulation and help the body defend itself against free radicals. 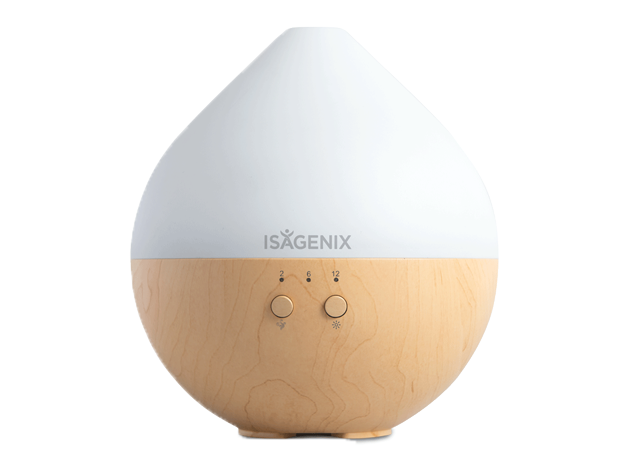 When diffused, it fills the air with an uplifting, invigorating aroma. Isagenix Airway – Enjoy a stimulating, revitalizing experience with Isagenix Airway, a combination of lemongrass, tea tree, thyme, rosemary, grapefruit, eucalyptus, and peppermint oils. Isagenix Content – Content, an aromatic blend of lemongrass, cinnamon bark, eucalyptus, and other powerful botanicals, is ideal for supporting healthy weight management. It makes an especially great addition to Shake or Cleanse Days. Isagenix TumBliss – TumBliss is a carefully crafted mix of several powerful oils, specifically designed to promote emotional wellness and confidence. When diffused, it adds a refreshing, minty aroma to the air that is designed to promote mental clarity and confidence. 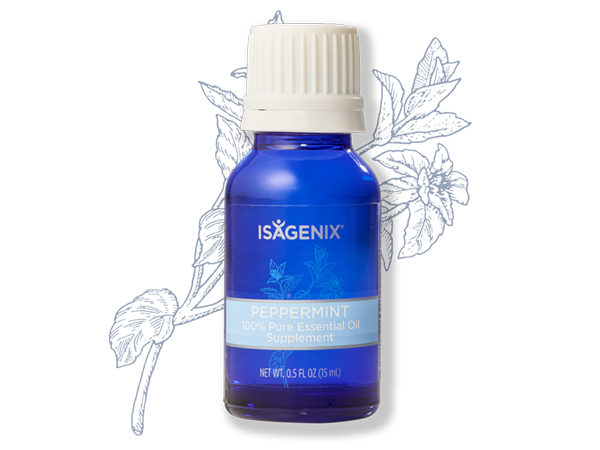 Get naturally invigorated and revitalized with peppermint oil -- nature's version of a pick-me-up! Trouble relaxing before bedtime? 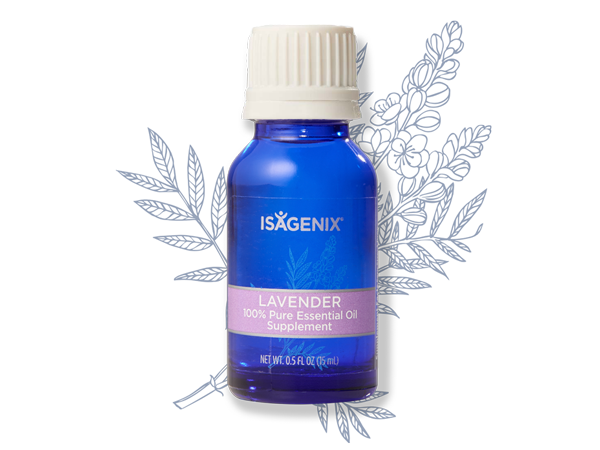 Look no further than Isagenix's lavender essential oil! Although it boasts a multitude of benefits, promoting a restful night of sleep is lavender's star quality.